Mumbai: Pay cheques to directors of companies in 2012-13 grew at the weakest pace in three years as a slowdown in the Indian economy crimped corporate profitability. The total remuneration paid to directors in the year ended 31 March stood at ₹ 415.46 crore, an annual growth of 18%, but faster than the expansion in net profit, according to comparable data available for 27 of the 50 members of the Nifty, the benchmark index of the National Stock Exchange, which have published their 2012-13 annual reports till 19 July. Directors’ pay had grown at a rate of 23.6% and 20.8% in the preceding two financial years. Net profit of these 27 companies was ₹ 1.5 trillion, an annual growth of 17.4%. In the previous two fiscal years, net profit grew by 21.9% and 8%, respectively. 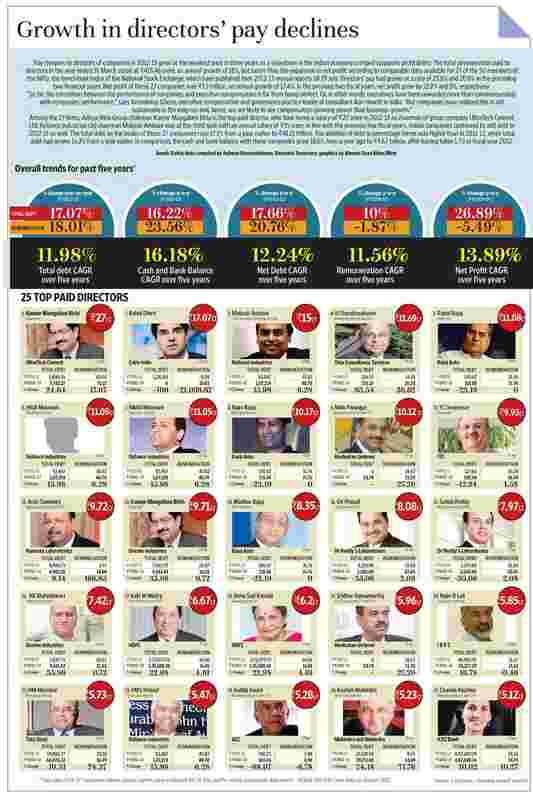 Among the 27 firms, Aditya Birla Group chairman Kumar Mangalam Birla is the top paid director, who took home a salary of ₹ 27 crore in 2012-13 as chairman of group company UltraTech Cement Ltd. Reliance Industries Ltd chairman Mukesh Ambani was at the third spot with an annual salary of ₹ 15 crore. In line with the previous few fiscal years, Indian companies continued to add debt in 2012-13 as well. The total debt on the books of these 27 companies rose 17.1% from a year earlier to ₹ 41.21 trillion. The addition of debt in percentage terms was higher than in 2011-12, when total debt had grown 16.2% from a year earlier. In comparison, the cash and bank balance with these companies grew 18.6% from a year ago to ₹ 4.67 trillion, after having fallen 1.7% in fiscal year 2012.